We captured this image of a bride and groom enjoying jamon iberico during their cocktail hour at Miami’s Fairchild Tropical Botanic Gardens. Jamon Iberico is considered the best ham in the world, and the father of the groom had this leg shipped from Spain specifically for his son’s wedding. This is a perfect example of a wedding that has a couple with two different ethnic backgrounds embracing both sets of traditions and melding them into one celebration. The night before the wedding, the groom and his family headed over to the bride’s parents house to participate in a formal Vietnamese tea ceremony. They brought with them the traditional gifts, one of which was a roast pig, setting the stage for some amazing pork themed food choices over the course of the weekend. Since Em has a sensitivity to all pork related foods, Steve was forced to take one for the team and eat twice as much as he normally would. We frequently opt to get a cheese and charcuterie plate as an appetizer when we go out to eat, an Em loves cheeses of all kinds while Steve is a true carnivore. Jamon Iberico has a certain level of mystique and intrigue, much like Kobe does in the beef world and Pappy Van Winkle does in the bourbon community. When you see it on a menu somewhere, you feel the urge, if not the need to indulge. One of our favorite restaurants in Las Vegas and Washington DC is Jose Andres’ Jaleo, and deciding to get the Jamon Iberico here is almost as easy as ordering the paella. There are plenty of other versions of dried and cured pork products and we happily appreciate the selection, but for special occasions such as this wedding, only the best will do. While this famous cut of ham dates back centuries in Spain and Portugal, the United States had to wait until 2007 to legally enjoy this delicacy as the US Department of Agriculture had never approved its importation. Iberico ham has been prevalent throughout much of Europe, so Americans traveling there had been able to try it for decades without a suitable version to enjoy back home. 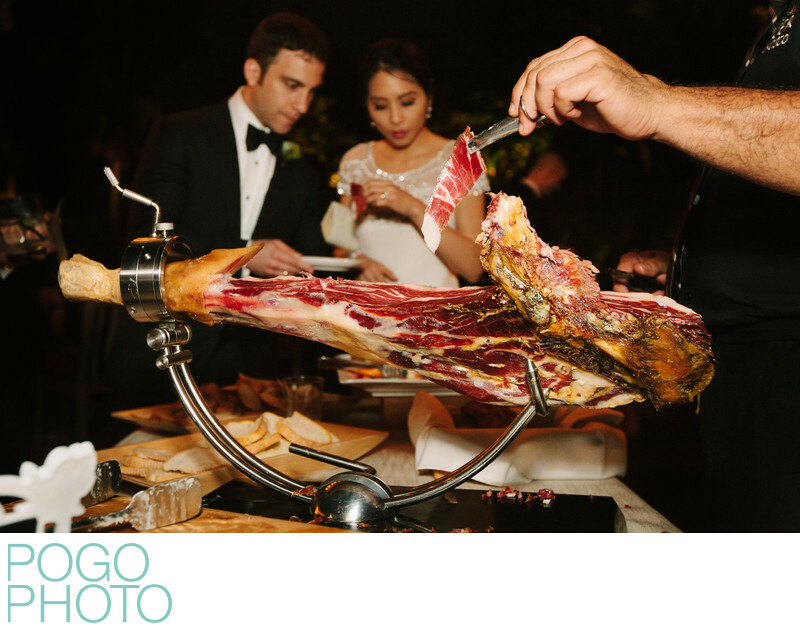 As some American establishments are now able to procure some jamon iberico, the father of the groom in this wedding went above and beyond. Working in the culinary field, he was able to supply the couple with specially crafted pastries for dessert and arrange for an impressively catered feast for dinner. To highlight their Spanish heritage and give this cut of meat the respect it deserves, it was placed on a jamonera and prominently put on display during cocktail hour. Steve might have been waiting for this very moment to incorporate the jamon into a candid photo of the couple. He may also have been hanging out in this spot because he bonded with the groom’s father over their mutual love for this slab of extravagant meat and the father kept proudly feeding Steve tastes of it every time we walked by. We shall claim it was the former reason and go back to drooling over the memory of that perfectly marbled cut of savory meat, slowly melting away on the tongue. Location: Fairchild Tropical Botanic Garden, 10901 Old Cutler Rd, Coral Gables, FL 33156. 1/30; f/4.0; ISO 1600; 35.0 mm.